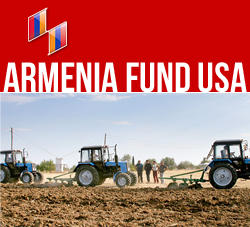 NEW YORK, New York — Within the framework of its ongoing Rural Development Program, the Armenia Fund completed two more projects in Armenia’s Tavush Region: a milk-collection center in Azatamut and a potable-water pipeline in Aknaghbyur. The projects were sponsored by the Fund’s U.S. Western Region affiliate, with financing from San Francisco’s Armenian community and the ARF Central Committee of Canada, respectively. The launch of the initiatives on May 11 was marked by opening ceremonies attended by a delegation of the Fund, community members, and local officials. Led by Hayastan All-Armenian Fund Executive Director Ara Vardanyan, the delegation included members of the Fund’s Board of Trustees, benefactors, and representatives of affiliates from throughout the world, who had traveled to Armenia to participate in the organization’s 19th annual Board of Trustees meeting and to visit the sites of several current and completed projects in both Armenia and Artsakh. Commenting on the milk-collection center in Azatamut, the community’s mayor conveyed his gratitude to the project’s sponsors and said that it will enable residents of Azatamut as well as neighboring villages to efficiently market their milk production. This process will be facilitated by two new trucks, which will make rounds throughout the surrounding 12 communities to collect milk and bring it to the collection center for shipping. The Armenia Fund delegation also visited the Noyemberyan Hospital, which is currently being reconstructed with financing from the Fund’s German, Swiss, Australian, and Lebanese affiliates. Informed that on the day of the delegation’s visit three babies were delivered at the temporary ward close to the hospital, Gilbert Moumdjian, chairman of the Fund’s German affiliate, said, “I hope that the completely renovated hospital will contribute to a rise in the number of births in the city,” before going on to add during an interview with reporters that the Armenian Physicians’ Union of Germany expressed commitment to covering the cost of all necessary furniture for the hospital. Another project site visited by the delegation was the Khashtarak School, whose 201 students have been enjoying their new, well-equipped campus for the past nine months. On behalf of the people of Tavush, the region’s Governor Armen Ghularyan said he hoped the Fund will continue to implement vitally important development projects in the area.